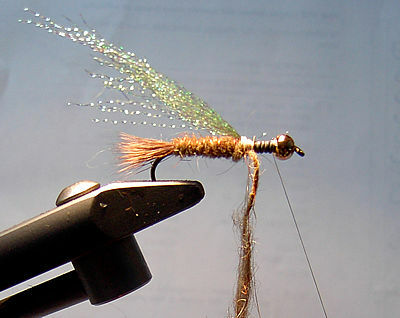 dubbing Hare's ear/Antron mix, natural or light olive brown. bead 5/32" bead in gold or brass color. 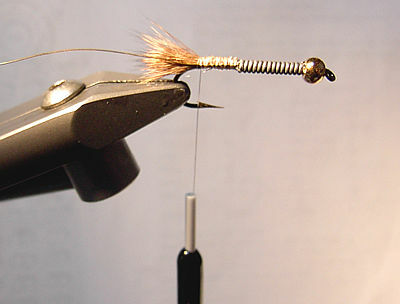 weight Medium lead wire, 10 to 15 wraps, pushed forward against bead-head. thorax and legs: Krystal Flash in peacock green. Over the past 5 years I have been using a variation of the bead-head hare's ear pattern created by adding a green peacock Krystal Flash wing case over the thorax and Krystal Flash legs. I call this variation a Bead-head Hare's Ear Flash. 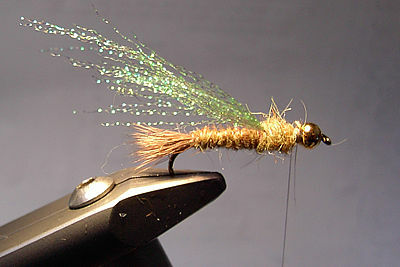 I have had great success with this pattern especially at Lake Almanor in late June. 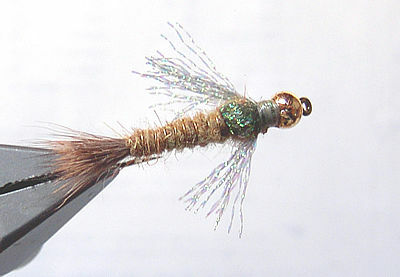 Trout must take it for the nymph of the Hexagenia mayfly. I also found it effective for crappie at Little Panoche Reservoir and other lakes last year. In both cases, I used a sinking or sink-tip line, and retrieved in short strips after a countdown of 5, 10 and 15, etc. until I found fish. 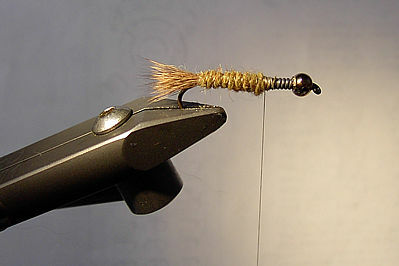 Put bead head on hook. You may have to pinch the barbs down to get them on. 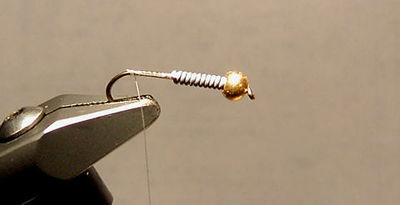 Wrap about 10-12 turns of medium lead wire onto hook and push forward under flared end of bead. 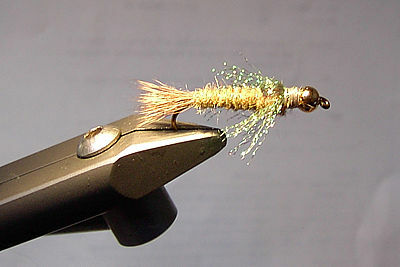 Cut and tie-in a small clump of fine deer-hair for the tail. 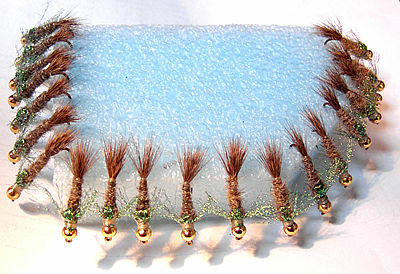 This deer-hair is usually found on the legs of the deer. 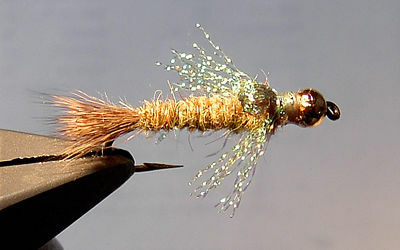 It flares nicely when tightened down during tying and stays that way while being fished. This tail is a variation to the standard hare's ear fly pattern. Tie in a 5" length of fine brass wire for ribbing body. A note to people tying with brass or copper wire: Always use an inexpensive pocket scissors or a wire cutter to cut wire used for ribbing. The wire will ruin your good tying scissors. Dub body up to thorax area of fly. For the dubbing I like to use a mixture of hare's ear fur and Antron mix, such as Borden's Hare-Tron mix in Natural hare's ear color of in the light olive brown. I use a little dubbing wax to hold the dubbing to the tread before making a dubbing loop and a Cal Bird tool to spin the dubbing tight before wrapping it onto the hook. Wrap the brass wire over body to form ribbing. Any extras wire should be wrapped around the lead in the thorax area. 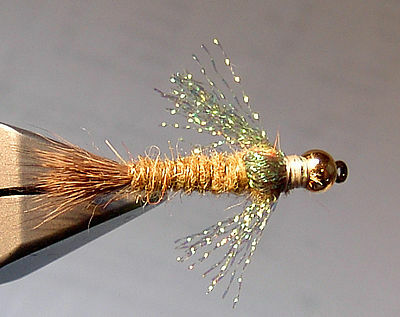 Cut 12 strands of Peacock Green Krystal Flash 4" long. Tie in strands just in front of body at the center and tie back. Make a dubbing loop of dubbing for thorax. Tie forward to form thorax. Fold Krystal Flash strands forward and tie down on top of thorax to form wing case. 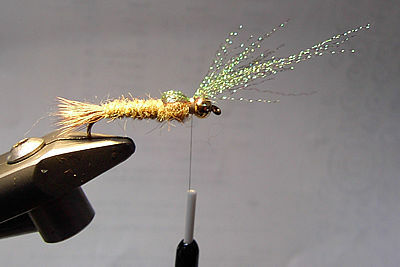 Separate strands in half and tie back one set to the left slanted downward and the other set to the right slanted downward and tie off fly. Cuts strands as shown to form legs as shown above, then put head cement on wing case and threads at head. Below is the same fly with the lighting changed. Notice the significant change in the color that comes through in the photograph. This is closer to the true color of the fly, but frankly any color dubbing that falls into the range of those shown will work fine. I've used the same pattern in a darker olive color with some success. Give the pattern a try. I hope it brings you as much success as it has given me. Time to go fishing. Tight lines!